Heating your home shouldn't be complicated, it should be simple and intuitive. Which is exactly what Nest is. Compatible with most heating systems, the Nest thermostat gives you precise control of the temperature in your home. Built-in sensors track your whereabouts to create a personalised, auto-adjusting temperature schedule based on those movements in the home, eliminating the need for complicated and time consuming programming… And you can still make manual adjustments, easily modifying the settings and controlling all aspects of your heating and hot water supply from anywhere using your phone, tablet or laptop. Because it learns from you. Nest gets to know the temperature you like when you’re at home and turns itself down when you’re away. It even learns how your home warms up or how draughty it is, so it only uses the energy it needs. Every month it creates a report that lets you see how your consumption fluctuates and it even helps you come up with ways to save money on your bills. It's programmed with your postcode, so it can monitor the weather outside and adjust itself automatically to ensure your home is always at the optimum temperature. Available in a choice of colours and available either wall mounted or self standing, Nest fits discreetly into your homes style and decor. As a Nest Pro Installer, we provide fast and efficient installation along with all the help you need so you can fully enjoy the many benefits this revolutionary new system offers. Installed and fitted for just £378.00, click here to make a booking. 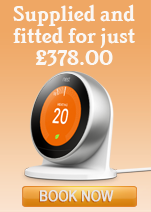 The Nest range also includes a number of sophisticated supporting devices, from smoke and CO alarms as well as indoor and outdoor security cameras, all of which are capable of talking to each other, so when you leave the home, the thermostat senses the house is empty and tells the cameras to switch themselves on. It's saving our customers money, making your home more energy efficient and giving them greater peace of mind and security. And as certified Nest Pro Installers, we are trained and authorised to install them all. Feel free to contact us. If you would like more information or any advice, please click here to get in touch.